The Silkroad features a frame with integrated rear rack for the best possible combination of low weight and high strength. By eliminating the aftermarket rear rack there are no bolts to come loose or tabs to shear off. The rack itself is stronger, stiffer and lighter. Fitting a rear rack to most disc brake equipped frames has been awkward at best. By designing the rack into the frame, this problem has been solved for good. The Silkroad is made in two versions, one is strictly for the internally geared Rohloff hub or similar hub like the Shimano Alfine, the other is for derailleur equipped drive trains. I no longer stock the version for derailleurs, but it can be special ordered. Usually takes about two months. The Rohloff version is equipped with an eccentric bottom bracket, enabling the chain tension to be adjusted without using a tensioner, keeping things simple. The 14 speed Rohloff Speedhub gives you a wide range of gears and is extremely reliable. A derailleur drive train is less expensive, but not as reliable or durable as the Rohloff. The derailleur version of the Silkroad frame can of course be fitted with a Rohloff Speedhub if you prefer. If you use a derailleur version with a Rohloff, you must use a chain tensioner. 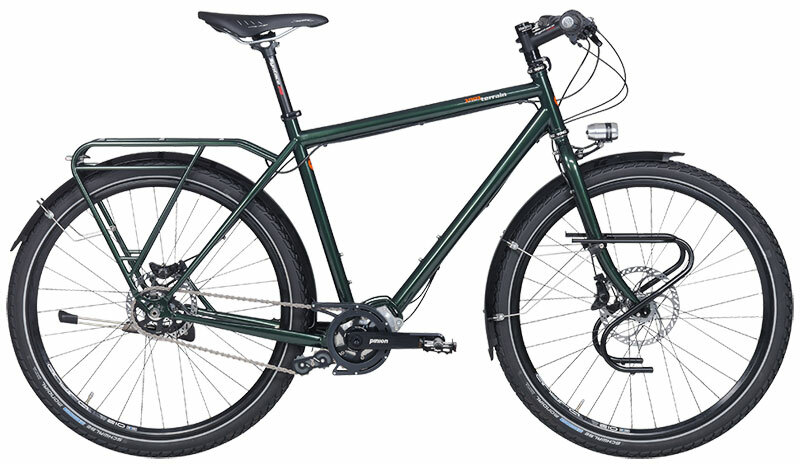 Tout Terrain bicycles are designed for disc brakes only. Disc brakes keep working even if your rims are damaged in a crash. There's plenty of clearance for 50mm wide tires and fenders. 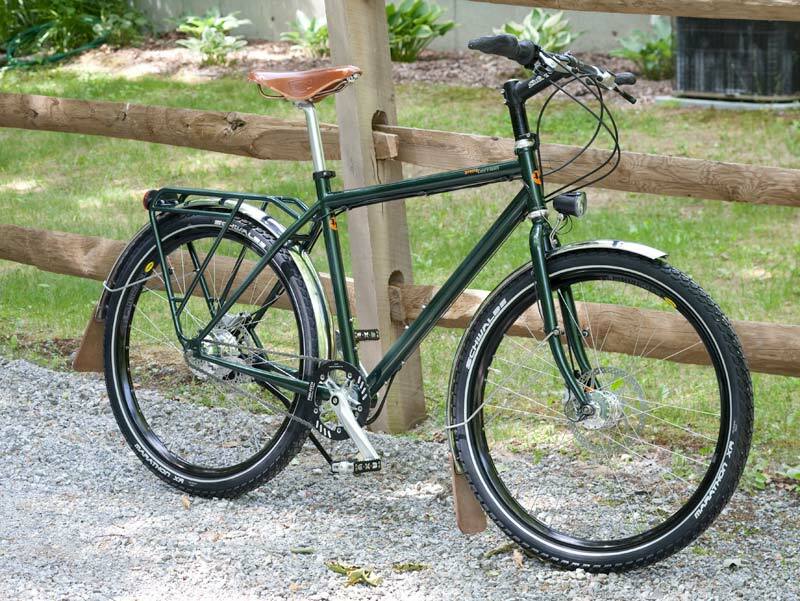 The frame has wiring retainers for lights, and the taillight wire even passes through the rear rack, eliminating the chance of damaging the wire while installing or removing panniers. For winter cycling in particular, the Silkroad has significant advantages over other frames. Disc brakes are superior to rim brakes in winter since they are far less likely to ice up. But in the past, disc brakes haven't worked well with rear racks. Not any more. 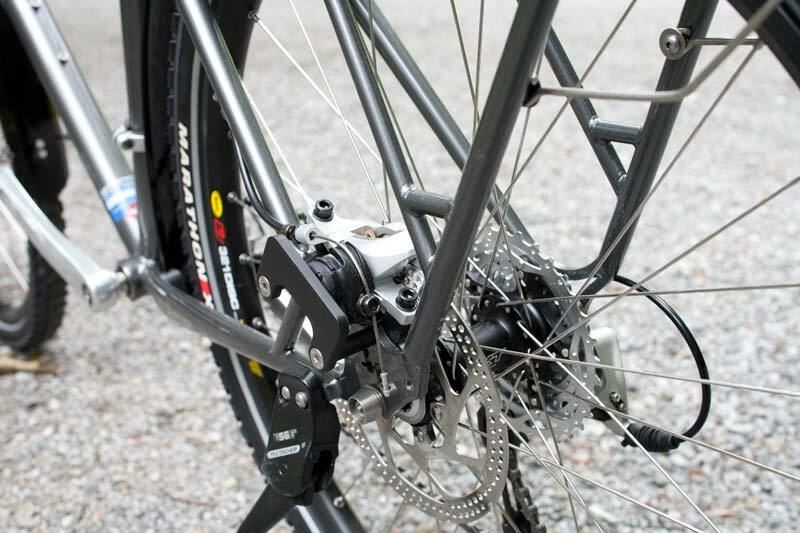 And the Rohloff 14 gear Speedhub eliminates the hassle of iced up derailleur systems. And don't be concerned about the Rohloff hub taking only 32 spokes. 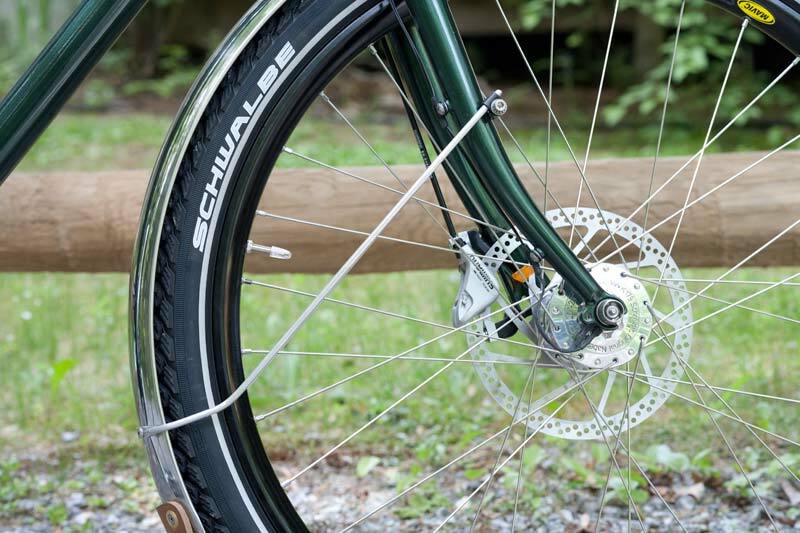 Since the Rohloff is dishless, the wheel is significantly stronger than dished wheels for derailleur equipped bikes. 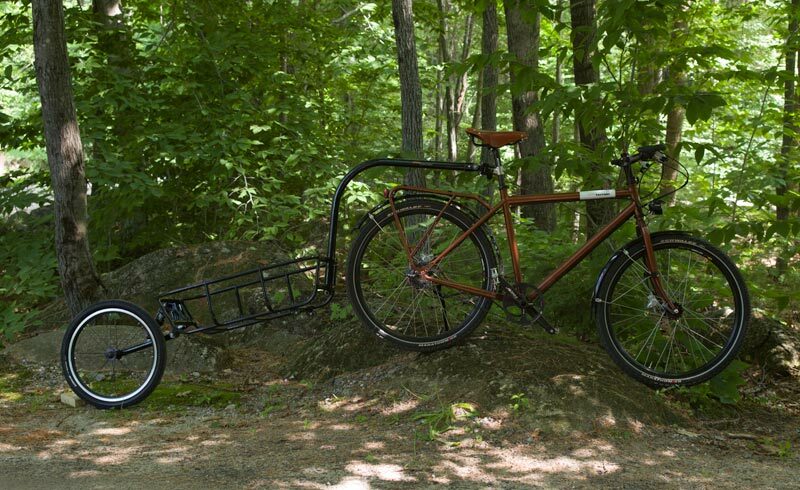 With only 32 spokes and a heavy duty 26" rim, a Rohloff rear wheel is tough enough for loaded touring, even on a tandem! That said, as of 2013 we also have 36 hole Rohloff hubs. It's overkill, but we have them. 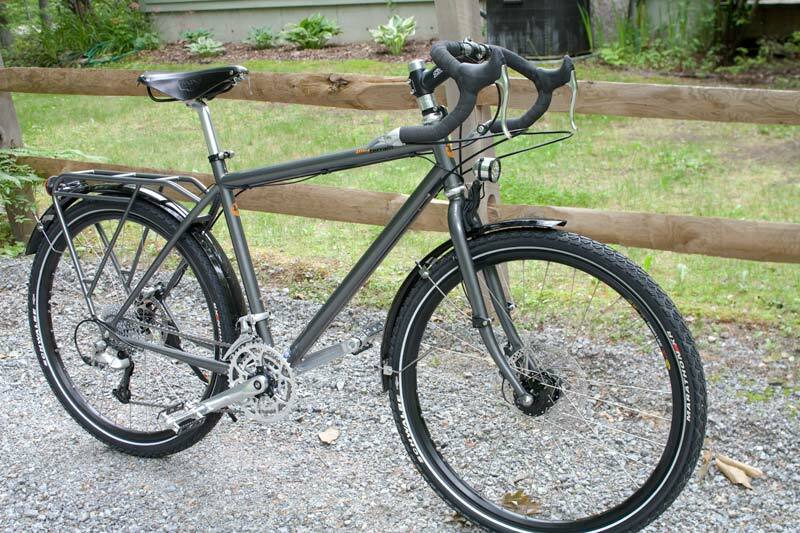 On the Silkroad, all braze-ons, dropouts and the entire rear rack are made from stainless steel, eliminating rust from those parts of the frame that would otherwise be most susceptible to rusting. Tout Terrain frames all have a special stop built in which prevents the fork from being turned more than 90 degrees to either side. 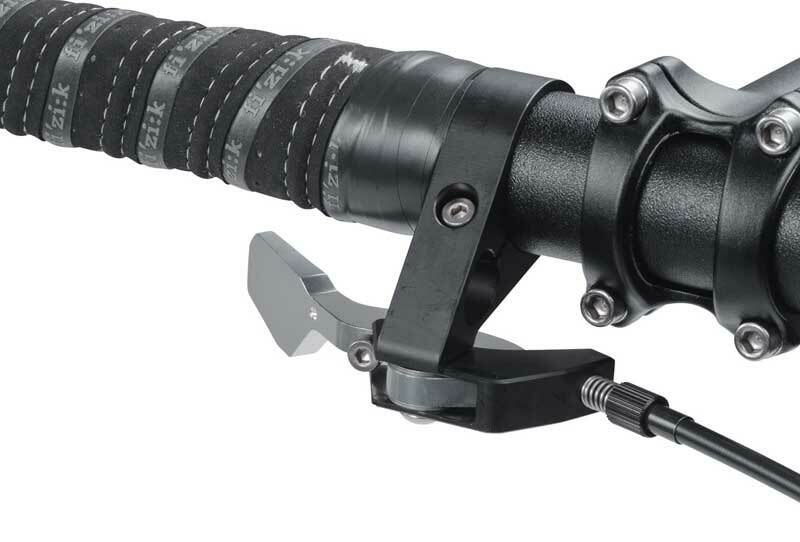 This eliminates a source of damage to a headlight mounted at the fork crown, as well as to the frame and any front rack. 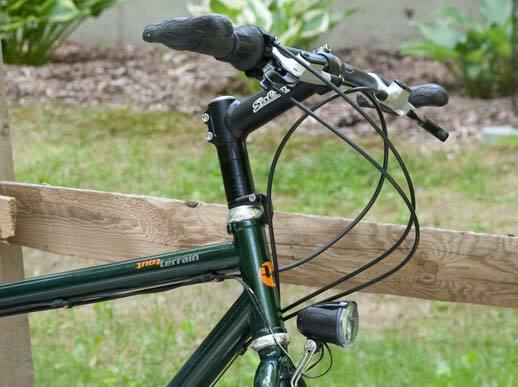 The rear rack has eyelets for mounting a taillight, either battery or dynamo powered. 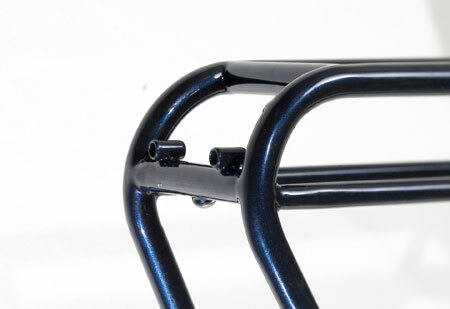 All Tout Terrain frames come with their innovative "Handlebar Stop". This device works in conjunction with a brazed on block on each side of the head tube. 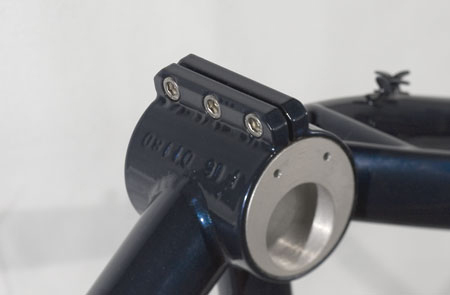 The stop clamps to the steerer tube and prevents the handlebar from turning more than ninety degrees in either direction, protecting the frame from damage, as well as any light mounted at the fork crown. This photo of the Handlebar Stop is of an early prototype. 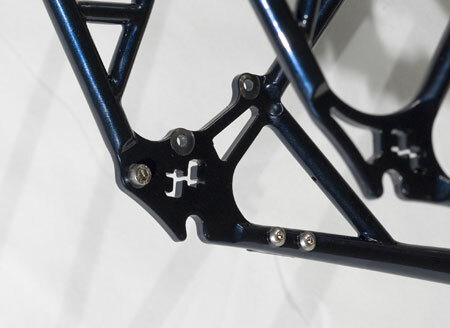 The production part is anodized black. Here's the Rohloff version of the Silkroad. Headset and stem are shown here for display. I have many headset and stem options. As you can see, there are many braze-ons for routing shift cables and brake lines. Three sets of water bottle eyelets are standard. The small triangle at the rear of the left dropout reinforces the seat stay against the torque from the disc brake. On the left you see a front view of the Silkroad fork. The blade on the left, which is actually the right blade, is thinner at the top. The blade you see on the right of the left photo, the left blade, is thicker at the top to compensate for the twisting action of the disc brake, which is attached to that fork blade. Looking at the photo on the right, you see the same fork, but now looking at it from behind. Now you see the left blade with the disc brake mount near the bottom, just above the dropout. On the back side of the right fork blade you see the three wire holders for the lighting system. A hub dynamo has its connectors on the right side. So the wires from the hub run up the back side of the right fork blade to the headlight mounted either at the fork crown or further up on the handlebar. The connector on the upper part of the left blade is for the disc brake line or cable housing. The Silkroad fork is designed from the ground up as a disc brake fork. It's asymmetrical to eliminate torque steer from the disc brake. The left blade is much stiffer than the right blade. 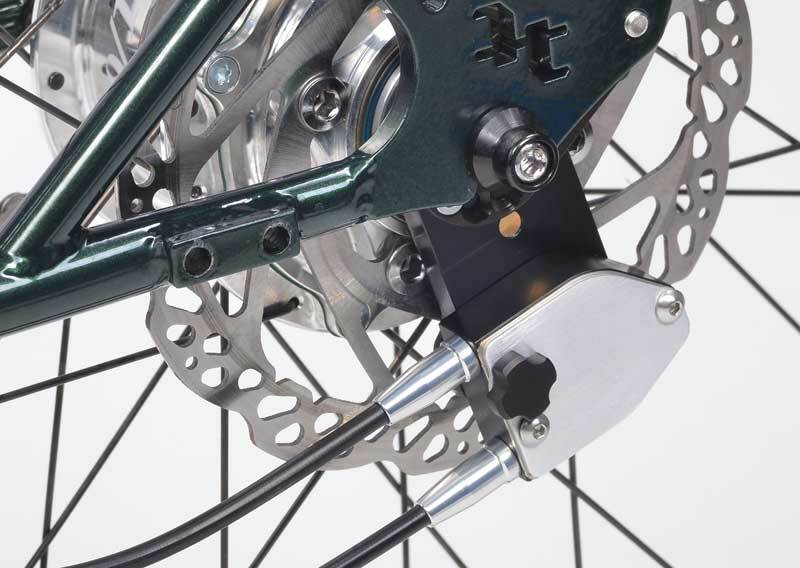 The dropouts face forward so that the action of the disc brake pulls the hub into the dropout. Everything about the Silkroad tells you that the designer understands the needs of the touring and commuting cyclist , as well as the mechanical requirements for a durable and trouble free transportation bicycle. The integrated rear rack eliminates bolts that can come loose, stiffens the rear rack, while at the same time reducing weight. Anyone touring or commuting by bicycle will have a rear rack, so why not build it into the frame? And doing so eliminates the problem of getting racks to clear disc brake calipers when you use an ordinary frame and retrofit it to take disc brakes. While some frames treat disc brakes as an added on "cool feature", the Silkroad's design makes no sense WITHOUT disc brakes. The designer knew from the beginning that this bike would be used for every day transportation, so the design assumes that dynamo lights will be installed. Nothing is "added on" as an afterthought with the Silkroad. It's all there, and was intended to be there from the start. 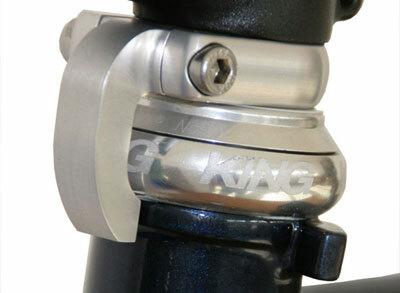 For another example, the ideal location for a headlight is just above the front tire, at the fork crown. But if you mount a light there with most frames, you risk damaging it if the front wheel flops over more than ninety degrees, jamming the plastic light against the downtube of the frame. But a Silkroad fork can't turn more than ninety degrees, eliminating damage to the headlight and scratches to the paint. Some frames (Santana comes to mind) use a shell design that has set screws to lock the eccentric in place. This holds the eccentric securely, the first time you use it. But the set screw puts an indent in the soft aluminum surface. This is not good, because if you need to make a fine adjustment, the set screw can dig into the edge of the indent made earlier, and you won't be able to make the very fine adjustment you would like. Other eccentric bottom bracket shells (Cannondale) use a complex eccentric in two parts that wedge against each other. These can hold very tightly in place, which is good, but will very often hold too tightly, making later adjustments extremely difficult if you can't loosen it. The Tout Terrain eccentric works by clamping the bottom bracket shell itself around the eccentric with heavy duty bolts. Provided the surface of the eccentric is greased, it won't seize in place, and you'll never have any difficult making precise adjustments to it. Why all frame builders don't do it this way is a mystery. Here's the left dropout of the Silkroad frame. See the cap screw head to the left of the dropout? That's to hold the Rohloff OEM2 axle plate in place, keeping the axle from rotating. All Silkroad frames are designed to take the Rohloff OEM2 hub with external shift box. Of course, the Silkroad Rohloff frame also accepts the Shimano Alfine 8 speed and 11 speed hubs, and has the correct braze-ons for the Shimano shifter cable on the right chainstay. The two machined holes, one above and the other above and to the right of the left dropout, are the mounting holes for the disc brake. Notice that these holes are machined after the frame is painted. That assures extremely precise positioning of the disc brake caliper. And you needn't worry about rust, since the dropouts are stainless steel, as are all of the braze-on bits. To the right of the dropout is a mounting point for a bolt-on kickstand, which I stock as an accessory. The two little tubes are for mounting a taillight to the back of the rack. They are 50mm apart, perfect for mounting European standard taillights, which I import from Germany. Just under the light mounts is a button head screw. It's for mounting a fender. There are other screws positioned properly on the rack and chainstays for the fender struts. Hidden from view is the outlet hole for the taillight wire which you can easily run through the top tube of the rack. 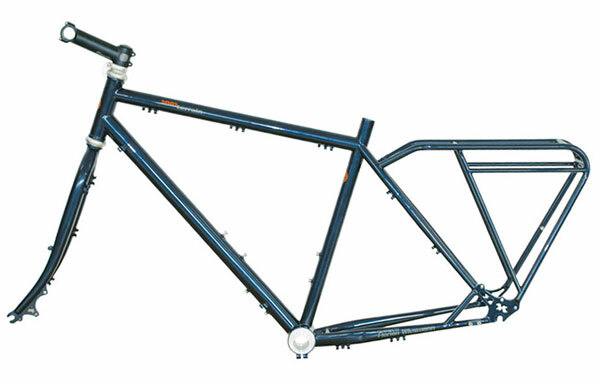 The top tube of the main frame has stainless steel mounts for the wire which is picked up from the fork crown, where a headlight would mount. You can wire the entire bike for lights without using a single zip tie. The Silkroad is designed for Rohloff and Shimano Alfine rear hubs. But there's another way to have internal gearing on a bike. 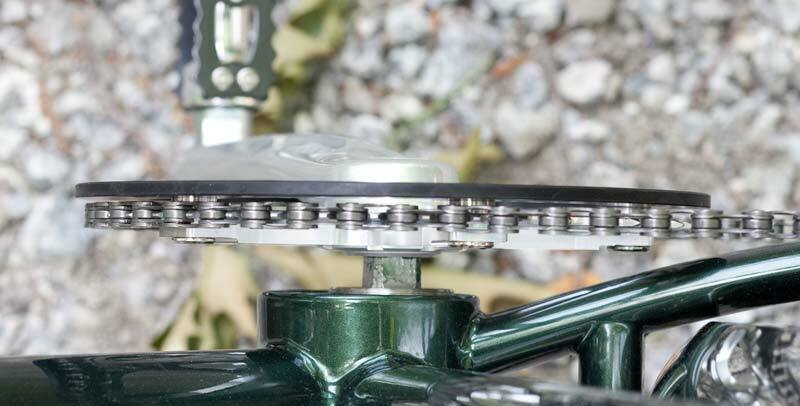 The Pinion system gives you 18 speeds in a transmision incorporated into the crankset. It requires a purpose-built frame, so it's a big commitment. But the Pinion transmission is very smooth. I like it a lot. We stock these in Medium and Large. Frame geometry is the same as the regular Silkroad. I can special order the Xplore in the Small size. That can cost a bit more if it has to ship from Germany individually. 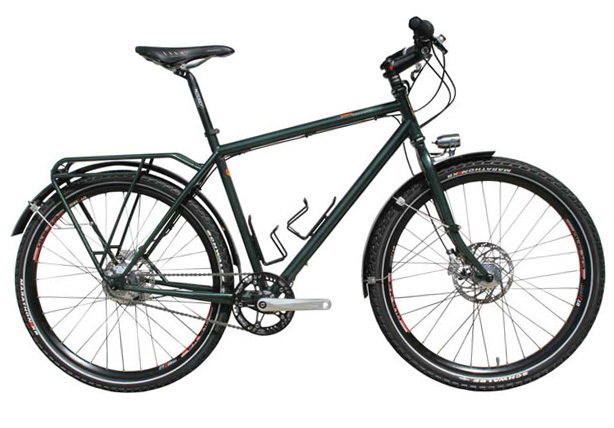 The Silkroad Xplore with 18 speed Pinion drive and cranks is sold with a Tout Terrain Blade SL fork, which works with the Schmidt SL dynamo hub, eliminating the need to connect and disconnect wires when installing or removing the front wheel. Choose from 165mm, 170mm and 175mm crank lengths. Prefer Derailleurs or a Road Bar? Here's a Silkroad set up for road bar, derailleurs and a triple crankset. This version of the frame can also use the Rohloff hub, but will require a chain tensioner since there's no eccentric bottom bracket shell. The derailleur version of the Silkroad hasn't sold nearly as well as the Rohloff version, so I'm closing them out. The closeout price is $700.00, frame only. This price is only for the frame we have left. We now have Extra Large only. The road handlebar won't take any brake levers that work with hydraulic disc brakes. So this bike uses mechanical discs by Shimano. One small annoyance is the caliper needs to move in and out when the brake is used. If this wasn't a touring bike, that wouldn't matter. But since this bike is likely to have panniers on the rear rack, the inner surface of the pannier will press against the brake caliper, preventing it from releasing from the disc after you brake. The solution is a small aluminum plate, mounted to the caliper mounts. This prevents the pannier from touching the caliper. The pannier will flare out a bit at the bottom, but it works fine. Since this is our demo, we left the steerer tube quite long so people trying the bike can adjust it to their needs. We generally ship bikes with the steerer extra long too, since the user often hasn't had a chance to test ride the bike. You can swap spacers from above or below the stem to raise or lower the bar. The stem can also be reversed. Once the owner knows where he wants the headlight mounted, the wire can be shortened. Here it's left long so a tester can try different light positions. Notice that the light mount isn't directly attached to the fork, but to a small cylinder below the crown that also holds the front fender. The Silkroad steel fork is longer than it might otherwise need to be, since the frame is suitable for a suspension fork. So the cylinder allows the fender to be properly positioned relative to the tire, and we also use it for mounting a light. One demo bike here at the shop is outfitted with a Rohloff hub. It's the bike pictured at the top of this page. It's a medium frame size with the standard fork. It weighs a bit over 32 pounds as pictured. The maximum carrying capacity of the Silkroad is 350 pounds. That weight includes the bike itself, the rider, and any gear being carried in panniers. Naturally, that assumes the wheels you use are up to the task. If you're buying the Silkroad from me with wheels built by me, don't worry. These are hand made frames. These are not custom frames. If you need something similar to a Tout Terrain frame, but with some different feature, you'll need to speak with a custom frame builder. To keep our prices reasonable, we must build these frames in batches. That precludes making a single frame with features different from what you see here. Most people will probably want their Silkroad fitted out with a Rohloff internally geared hub. 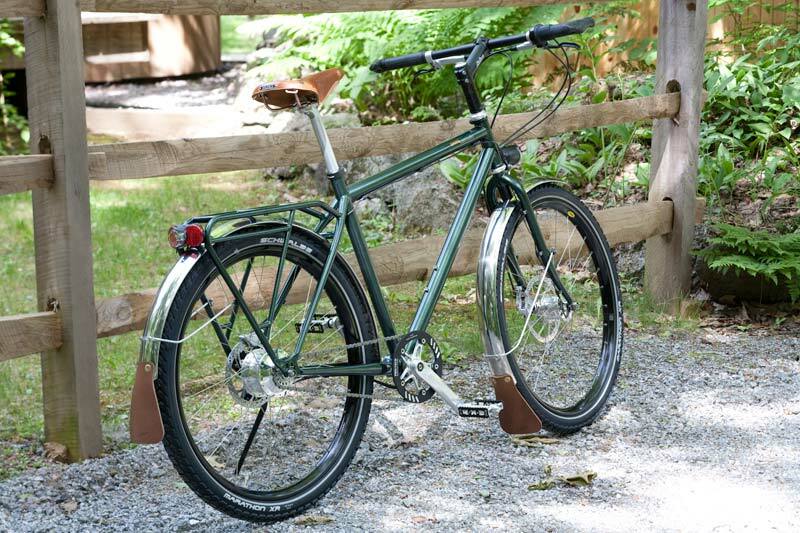 The Rohloff has fourteen well spaced gears for a wide range of ratios to handle any touring application. It's far more reliable than derailleur equipped bikes. Just keep the hub oiled and clean the chain. The hub will outlast the rider! The Rohloff version of the Silkroad uses an eccentric bottom bracket shell, just like on a tandem, to adjust the chain tension. And there's no funky wedge system to adjust this eccentric. Just three heavy duty allen bolts clamp the bottom bracket shell tightly around the eccentric, with no set screws digging into the eccentric itself, and no wedge to seize up. It's simple and reliable. Shimano now makes a mechanical disc caliper (BR-R505) to work with road brake levers like STI, Ergo, Cane creek or the very popular R400 and R600 levers. So if you want a Silkroad set up with drop road bars like the Nitto Noodles or Modolo X-Tenos, we can do it. The Rohloff shifter can be attached to the end of any road bar with an adapter from Hubbub that fits a bar the way bar end shifters do. Shimano, Phil Wood, and TA bottom brackets all require special tools for installation. I have them available for sale. If you order a kit, the bottom bracket and headset will be installed for you, and the wheels will be built by me. To assemble the above kit, you'll need to install the cranks on the bottom bracket, install the brakes, the stem and handlebar with brake levers and Rohloff shifter, run the cables and brake lines, drill holes in the fenders for the struts and frame fixing points, attach brake rotors to the hubs, trim fender stays, install seat post and saddle, and pump up the tires. 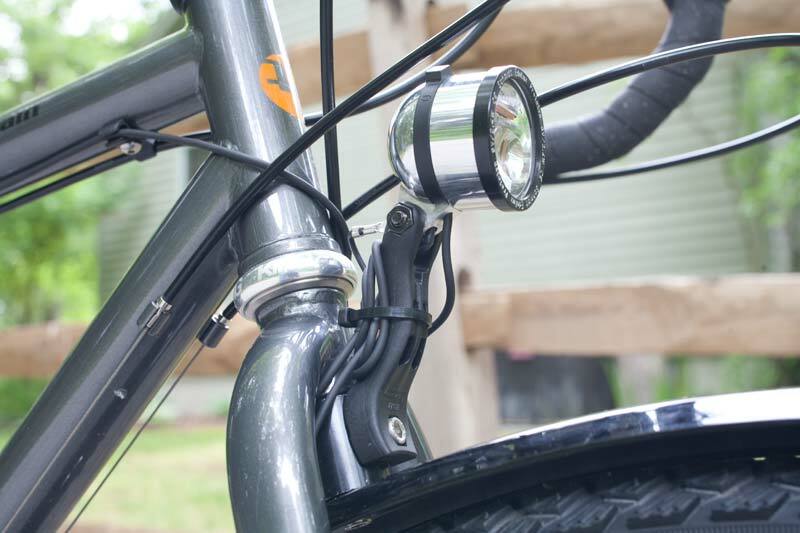 Stainless steel braze-ons keep all cables under control, not only for the Rohloff shifting system, but also for the hydraulic brake lines and wiring for the headlight(s) and taillight. Nothing is left dangling and you'll need no zip ties either. All the braze-ons are painted to match the frame. But given that braze-ons are the places where paint is most likely to chip, the use of stainless steel means you'll get no rust after those inevitable chips happen. Special fenders are available, 60mm wide, in both plastic/aluminum sandwich from SKS and stainless steel from Gilles Berthoud. Since the fender braces and mounting points are a bit different with the Tout Terrain frames, I've had these fenders made without holes predrilled, so that you can locate the holes precisely where your frame needs them, for perfect fitting of these extra wide fenders. Before now, the widest Berthoud fenders available have been 50mm. But I've managed to get Gilles to make us some of his wonderful stainless fenders in a 60mm width for the Tout Terrain frames. And they'll still have his super light aluminum struts, so even though the fenders are the toughest available, they aren't heavy. When mounting these plastic/aluminum sandwich SKS fenders, be sure to pad each side of the fender where it bolts to the frame to reduce the chance of cracking. Cork from a wine bottle works well. Which type of handlebar is best? There are two types of handlebars that work well with a Tout Terrain, though one is clearly superior, I think. You can use a "drop" or "road" bar, like the type used on "racing" or "road" bikes. Road bars offer several hand positions, making long rides more comfortable. While most "racing" bikes have the handlebar positioned quite low relative to the saddle, there's no reason the bar has to be placed so low. 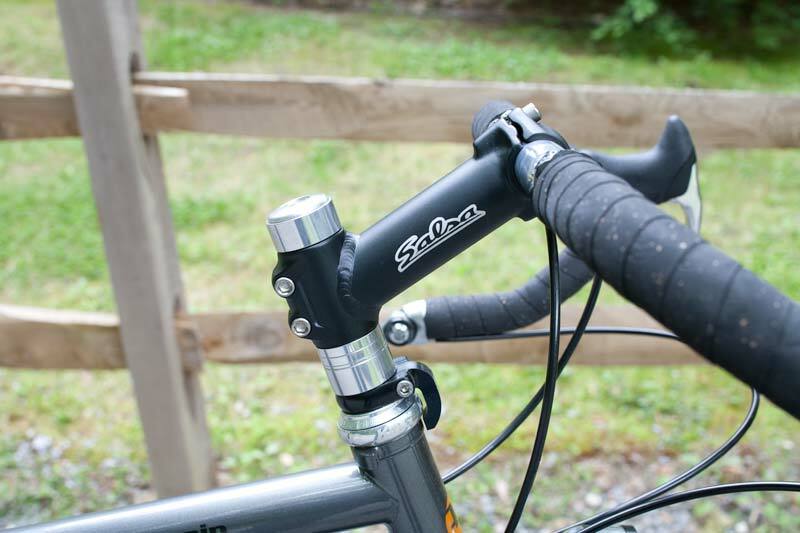 So the road bar, from the standpoint of getting the very best fit, can be superior. But, hydraulic disc brake levers aren't available for road bars, and the Rohloff shifter is designed to mount on smaller diameter MTB bars. So I think there's a better way. On a road bar, the most comfortable position is usually on the tops of the brake hoods. 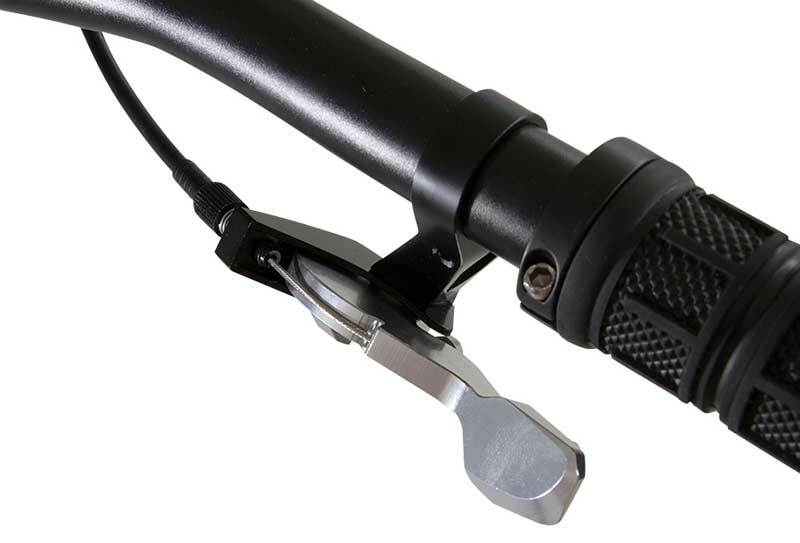 Cane Creek makes a special grip called Ergo II for MTB bars that clamps onto the ends of the bar, and replicates the padded top of a road brake lever. So you have a very comfortable hand position for long rides. This position is generally more comfortable than holding the MTB bar where you grip the brake levers or the Rohloff shifter. In that position, you need to rotate your wrist inwards. The Ergo II hand position is more natural, and getting to the brake levers or shifter is very quick. In traffic, of course you would keep your hands at the brake lever position. 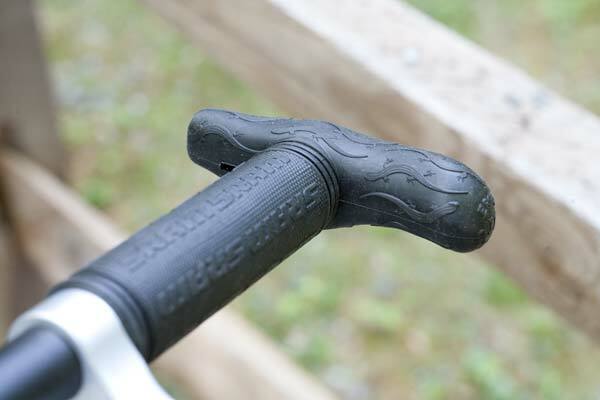 But I believe that these Ergo II grips eliminate the problem of using MTB bars for long distance touring. So you can have the benefits of hydraulic disc brakes, and the Rohloff shifter, without the usual compromise of reduced hand comfort. 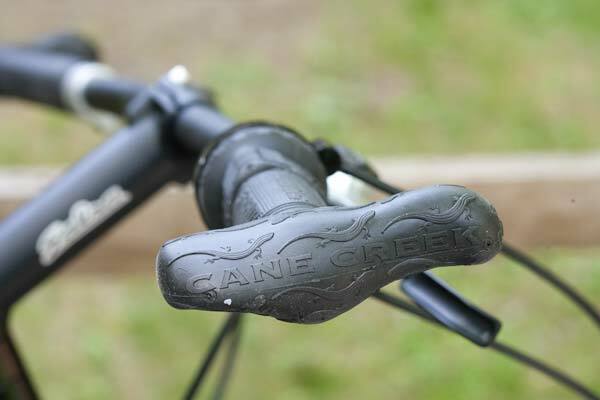 Another view of the Cane Creek Ergo II grips. We also have Ergon grips. The Rohloff hub has a 54mm chainline. That means the center of the cog is 54mm from the centerline of the frame. This coincides with the outer chainring position of most triple cranksets. I like to set up the Rohloff equipped Tout Terrains with a single ring in the outermost position on the crank. TA makes a nice chain guard ring that just fits between that outer position and the crank arm on the Carmina crankset. The bolt circle of the chain guard ring is 130mm. So, by using the 130mm bolt circle spider and a middle position chainring, the chainring moves to the outer position. Then we use a 4mm spacer and bolt on the chain guard ring. Here's how it looks from above. Notice the long extension of the steerer tube, and how the stem is at the very top. Every Silkroad and Boulevard we sell is built for the individual customer. This customer wants a high handlebar and lots of standover clearance. He's tall, but he's getting a medium frame. He could easily use a large frame, but then he'd have less standover clearance. Since there's no downside to using the smaller frame, why not? Well, some people think it looks funny. So they'll choose the larger frame. No problem. 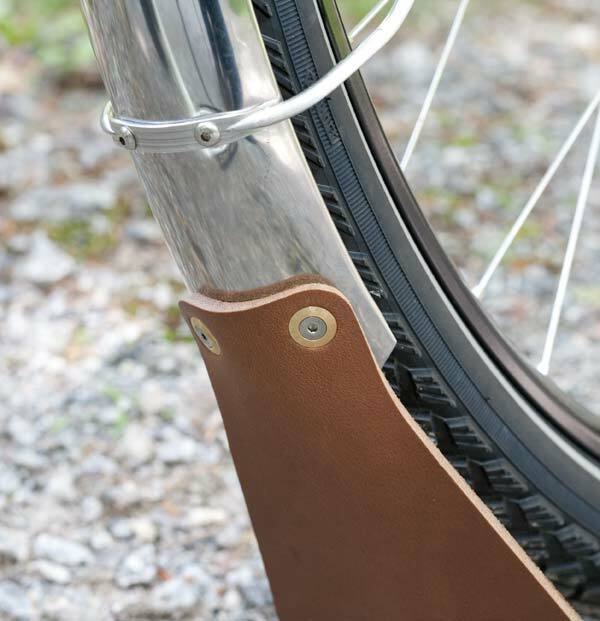 Berthoud's new leather saddles have rivets to match these on the mud flaps. The front fender struts can be attached either at the dropouts, or at the mid fork braze-ons, which also are used for mounting a front rack, like the Tubus Duo. Here we're using the mid fork just to keep the dropout area clear, and make it easier to attach the wire for lights. The aluminum fender struts are easily bent without sacrificing strength.